Home / airlines / analysis / tips / What happens when inflight purchase goes bad? Online shopping portals give a replacement/refund option within certain number of days if customer is not happy with the product received or if the product is defective. How does this process work with airlines if the in-flight shopping goes wrong? Almost all airlines, mainly international ones try to sell some stuff on board- perfumes, electronics, toys and several other category of items. Though they are never cheaper on air, the in-flight magazines always claim you’re saving big time by buying them. Not many buy stuff on-board, but few who do usually buy it for the convenience of it- they are sitting idle with nothing else to do- instead of spending their precious time when on ground hunting around for shops/websites to buy, buying in-flight is a quicker option for them, not necessarily because it is cheap or durable. For airlines, being able to sell some stuff for a small margin is one more source of additional revenue. Now, buying something is not always a smooth experience. Products could be defective- sometimes you will only know when you reach home and try to use them, products can develop faults or it may not be of promised quality/ compatibility etc or you might realize that it is available for lot cheaper elsewhere. If so, what happens if your in-flight shopped product goes bad? Before you read further, if you had bought anything recently, just pray that it lasts long and doesn’t develop problems. Airlines do not have any interest/motive to provide after sales service to the products they sell on-board. While they want to pocket some money by selling stuff in flight, deploying lots of staff for after sales service or having a customer friendly refund/replacement policy will hurt their margins. Of course, they can’t declare “we can’t help if your shopping with us goes wrong, you will be own your own”. So they are required to keep some process in place to address grievances/complaints. So what airlines typically do is keep the complaint process super complicated, so that most customers find the refund/replacement process simply not worth it to pursue. Consider Air Asia for example. 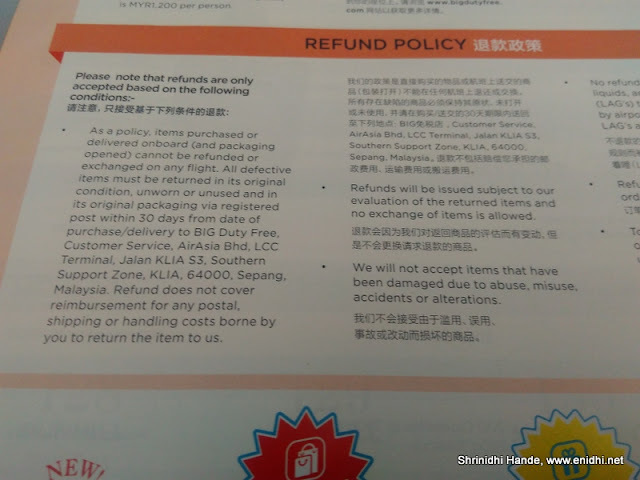 If you buy something from them and it goes bad, you need to send the item to Kuala Lumpur at your own expense, within 30 days of purchase unused then airline will decide if your complaint is legitimate or not at their discretion and if they accept it then Air Asia will process refund. What if you detect that a cloth item is losing colour after first wash? What if an electronic item stops working after few months and so on? No provision to explain all that. You have to spend couple of thousand rupees to send it to Malaysia- this shipment cost could be more than item cost. Also not clear what happens if the airline doesn't agree with your complaint. Will they send it back or keep it with themselves? An easier way for them would be to setup a counter in their hubs- like KLIA2 or DMK etc, wherein passengers can bring in the defective product and collect a replacement while boarding their next flight. But no, that would be too easy for customers to make a complaint and get a replacement. By asking buyers to send the item by courier to Malaysia, most complaints will be eliminated upfront- as cost of courier from say India to Malaysia will probably be more than cost of the product itself, or at least close enough, making the whole process nonviable for the customer. I asked an Indigo staff what happens if the product purchased in flight is proved to be faulty or doesn’t survive the warranty period- she didn’t have an answer. I have a feeling that most airlines have policies as complex as that of AirAsia, making a refund/replacement request either not practical or not worth a customer’s time and effort. If the product is from a reputable brand that has service centres worldwide, it is easier to get it repaired. But most airlines sell items with brand names hardly popular or brands that have near zero physical presence in various countries worldwide. Having shady brands making it difficult for customers to cross check if the value quoted onboard the flight is genuine or not is one of the ways how airlines manage to trick passengers into buying. Check the brands- most of the times, the brand name is something you’d not have heard on the ground. Unknown brand means any after sales repair, warranty claim etc are almost impossible. Do read the fine print that explains refund/replacement process in case of faulty products. In most cases this is enough to deter from buying. If you’re tempted to buy, avoid buying in the onward flight. Take a photo of the items you find worth buying in-flight, when on ground do some checks on the brand, price etc. If it is still cheap/better in-flight, buy during your return flight. Jet Airways sells stuff via Ava- read my earlier review here. What has been your experience in this? Do you buy stuff in planes? Has your in flight shopping ever gone bad? Do share your opinion on this.